4846 536x HAN 80 Pfg. Airmail 1934, block of four with the lower sheetmargin with house order number \"16794.37\", by of this denomination value by Michel so far unknown, in perfect condition mint never hinged very rare! 4847 ∆ 539y 3 RM. Count Zeppelin with rare horizontal gum rippling from lower margin on magnificent letter piece, perfect used \"NEUSTADT 23.5.37. \", an exception copy for the highest standards! Expertized Schlegel BPP. 4847A ✉ 539y 3 RM. 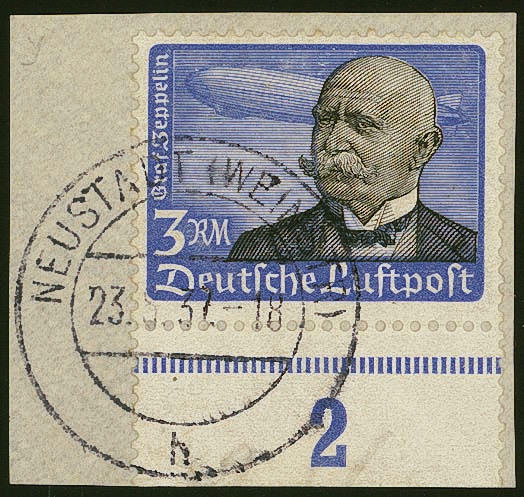 Zeppelin with rare horizontal gum rippling, fresh colors and in perfect condition as a single franking, not correctly franked, on decorative registered special delivery air mail letter with special cancellation \"Munich capital the Movement birthday of the Leader 20. 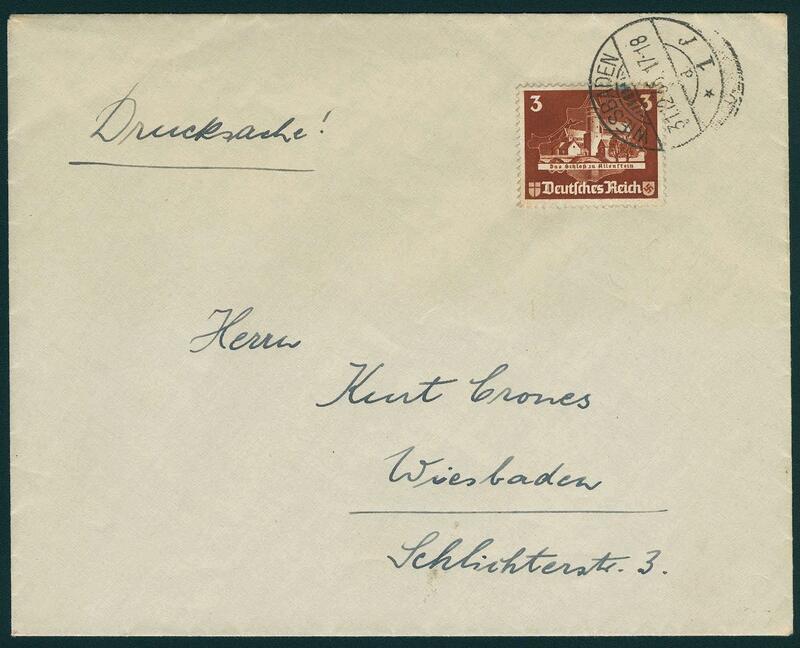 APRIL 1938\" to Hamborn with arrival postmark. So nice covers of this rare stamp are rare! Photo expertize Schlegel BPP. 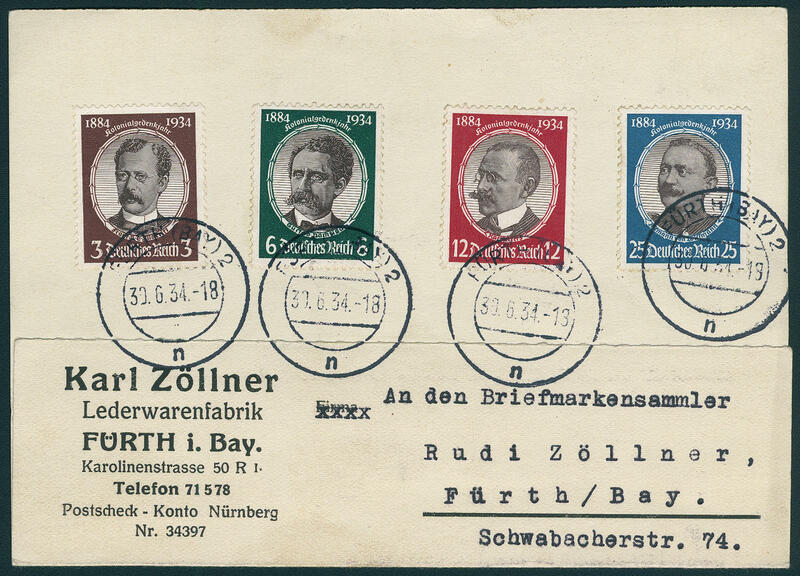 4848 FDC 540/43 Colonial researcher 1934, faultless set on very nice First day card from \"FÜRTH 30.6.34. \". F.D.C. Documents of this issue are rare! 4849 ✉ 540yaHAN 3 Pfg. Colonial researcher, horizontal lower margin pair with house order number \"13278.34 1\", in perfect condition with additional franking 6 Pfg. 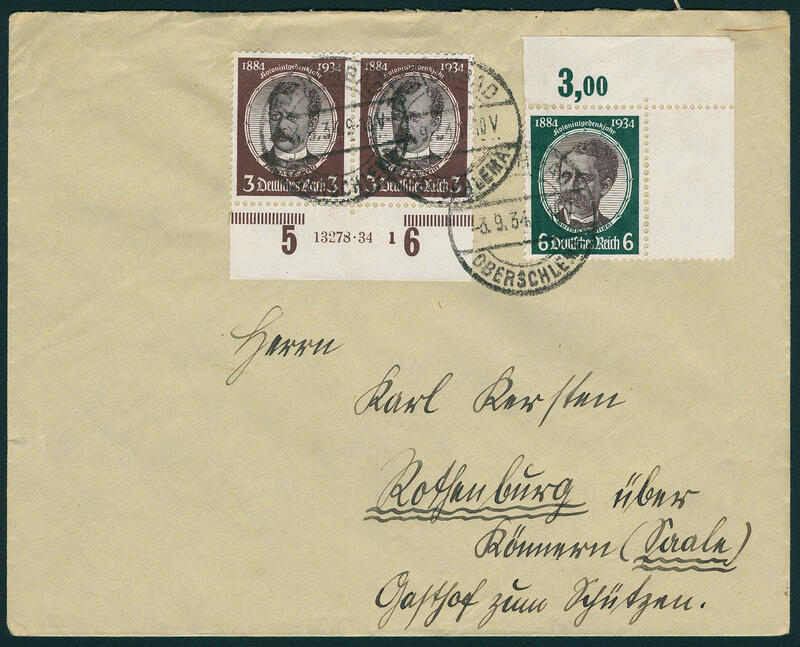 From of the right upper corner of the sheet on correctly franked cover from \"BAD OBERSCHLEMA 3.9.34. \" to Rothenburg. House order numbers on cover are very rare! 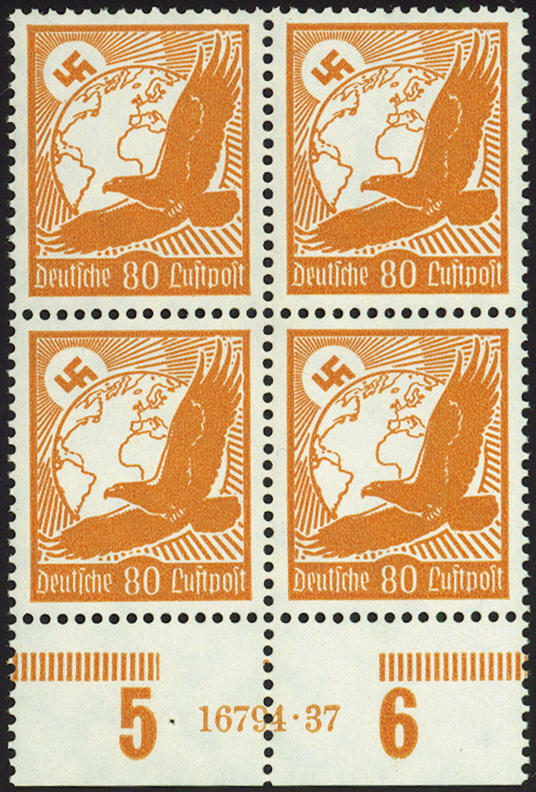 4850 ✉ 546/47 Nuremberg Nazi Party Congress 1934, faultless block of four set with high quality additional franking 1 RM. Chicago travel 1933 and so on. On two very nice registered Zeppelin covers to the 11. 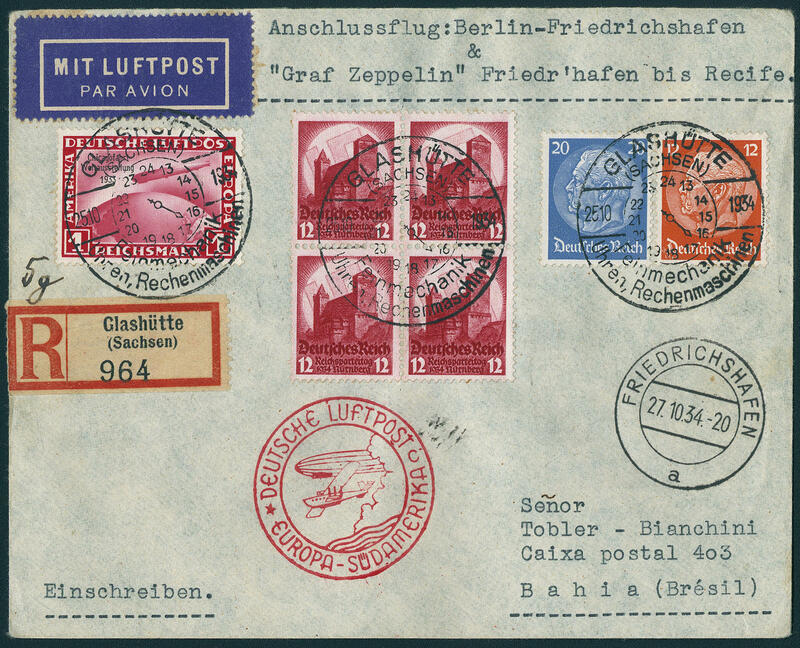 South America flight 1934 with all transit and arrival postmarks, as well red special confirmation stamp, to Brazil. Very decorative and rare! 4851 556/64 Professions set 1934, fresh colors and in perfect condition mint never hinged Michel 600,- €. 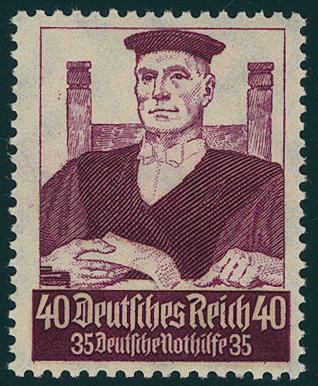 4852 556/64 Professions set 1935, fresh colors and in perfect condition mint never hinged, top values expertized Schlegel BPP. Michel 600,- €. 4853 565Abart 3 Pfg. 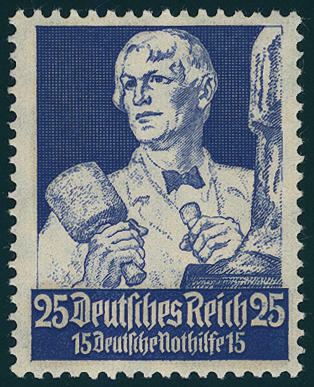 Saar plebiscite 1935 with rare variety \"upper margin of sheet IN stamp size\", perforation slightly prefolded, fresh colors and in perfect condition mint never hinged these variety emerged through a sheet miscut in the Empire printing office. 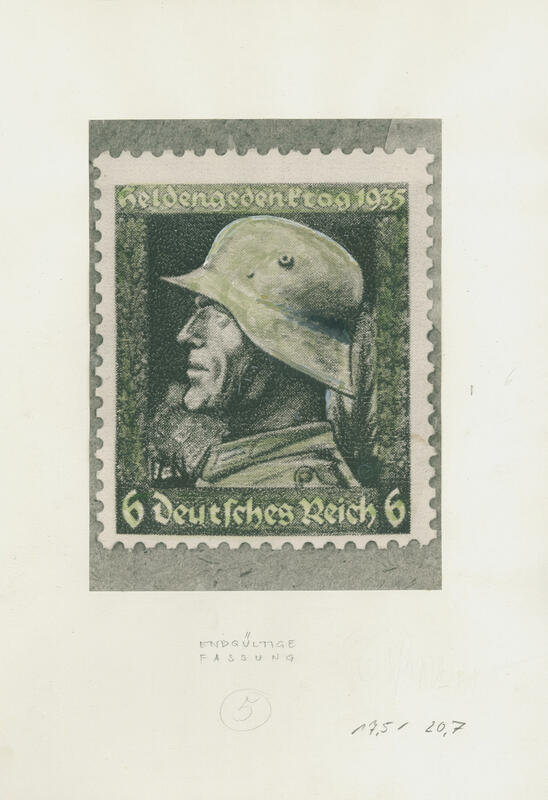 A Third Reich rarity, the up to now in the Michel special catalogue unlisted is! Photo expertize Dr. Oechsner BPP. 4854 ✉ 568 25 Pfg. 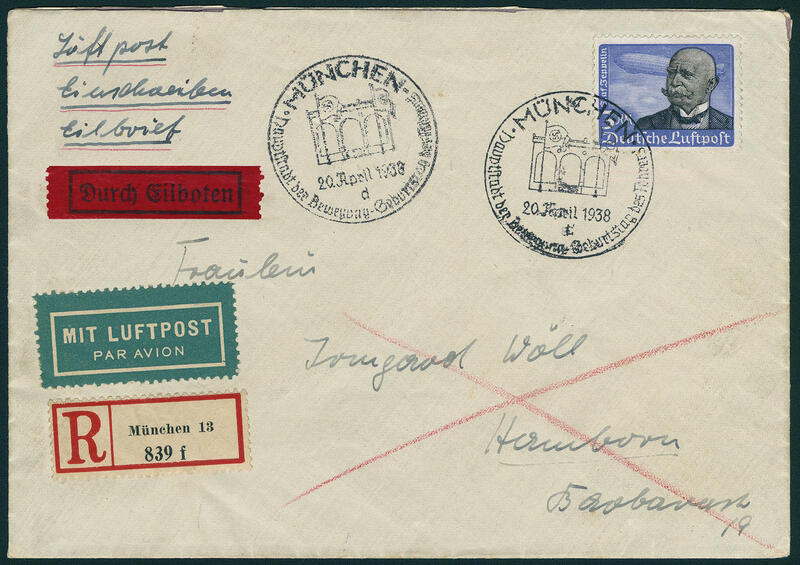 Saar plebiscite 1935, horizontal strip of four from the left upper corner, as well vertical margin pair as correctly franked pure mass multiple franking on very nice air mail letter from \"BERLIN 2.2.35. 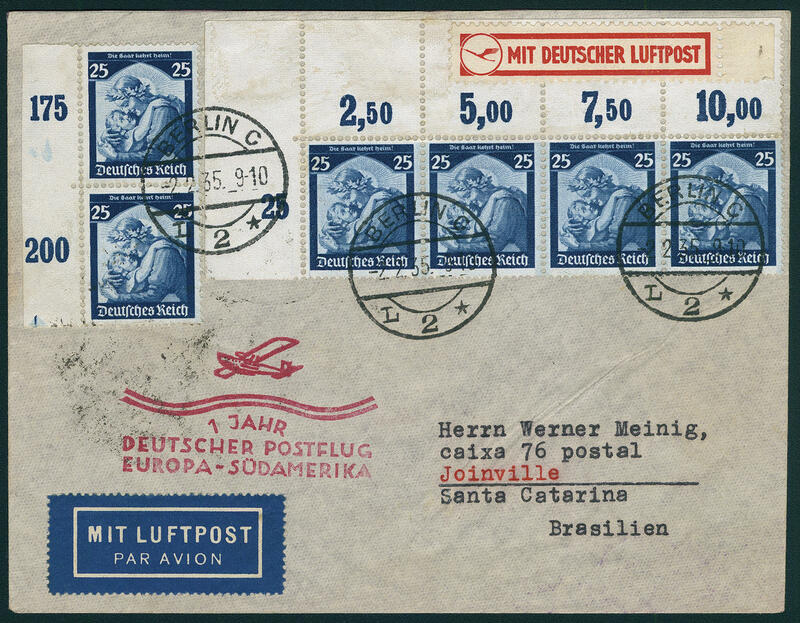 \" with red special confirmation stamp \"a year German mail flight Europe South America\" to Brazil with arrival postmark. Extraordinarily decorative and rare! 4855 572y 12 Pfg. 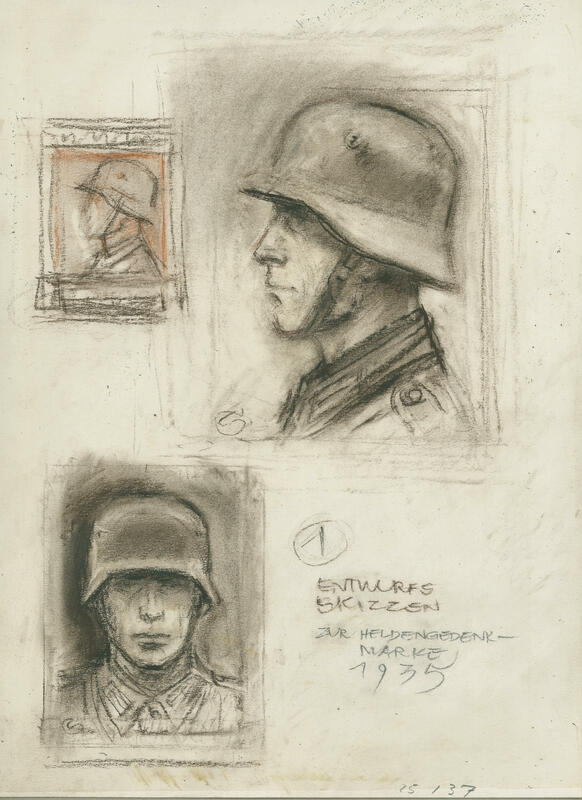 National Vocational Competition 1935, good horizontal gum rippling, in perfect condition mint never hinged Michel 160,- €. 4856 ✉ 576 3 Pfg. 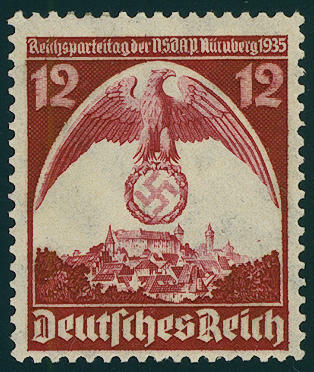 Ostropa 1935, stamp from the souvenir sheet as correctly franked single franking on local printed matter from \"WIESBADEN 31.12.35. \". Extraordinarily rare! 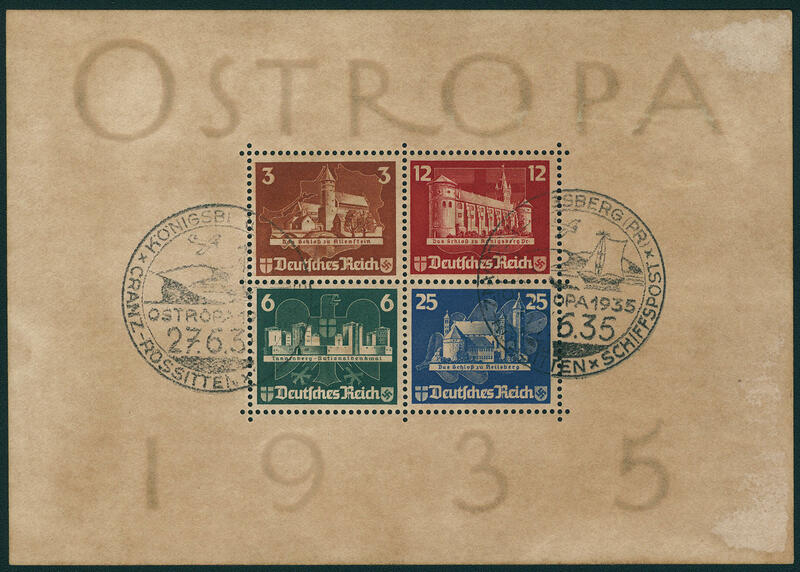 4857 ⊙ Bl.3 Ostropa souvenir sheet 1935, fresh colors and in full original size with good shipÂ´s mail special cancel \"KÖNIGSBERG 27.6.35. \" throughout outstanding quality. Photo expertize \"the condition is perfect\" Schlegel BPP. 4858 582U 25 Pfg. 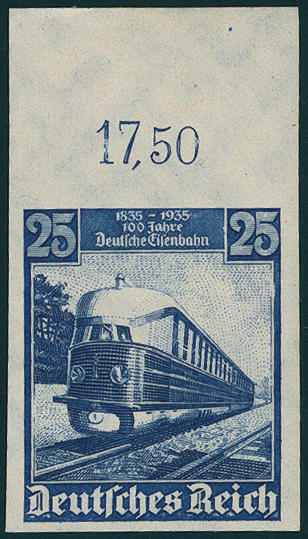 Railroad 1935, four sides unperforated from upper margin, fresh colors and in perfect condition mint never hinged, without any signs. A very scarce variety and as upper margin copy especially attractive! Photo expertize \"the condition is perfect\" Schlegel BPP. 4859 587Y 12 Pfg. 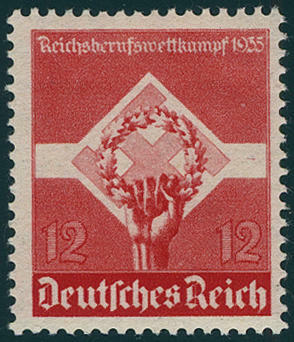 Nazi Party Congress 1935 with scarce inverse watermark, fresh colors and in perfect condition mint never hinged, signed A. B. Expertized Peschl BPP. 4860 draft 589 6 Pfg. 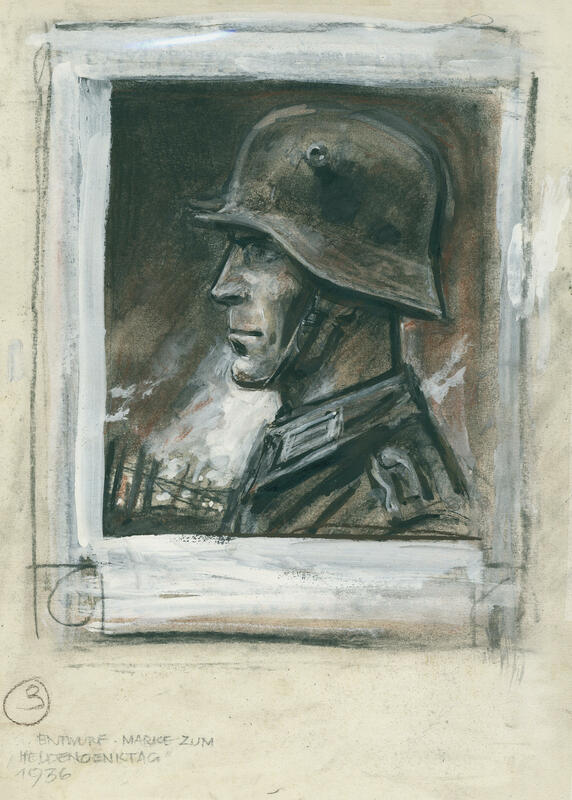 Heros commemorative day 1935, hand painted Original-design (final mount) in the passe-partout. 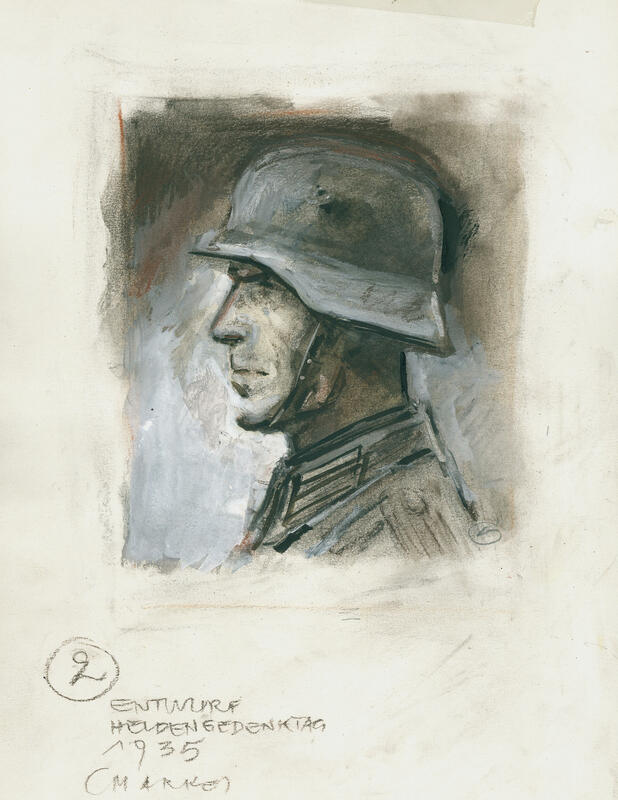 In this kind an unique rarity of the third Reich! (size of the design 29, 5:41, 5 cm). 4864 ✉ 606L 50 Pfg. 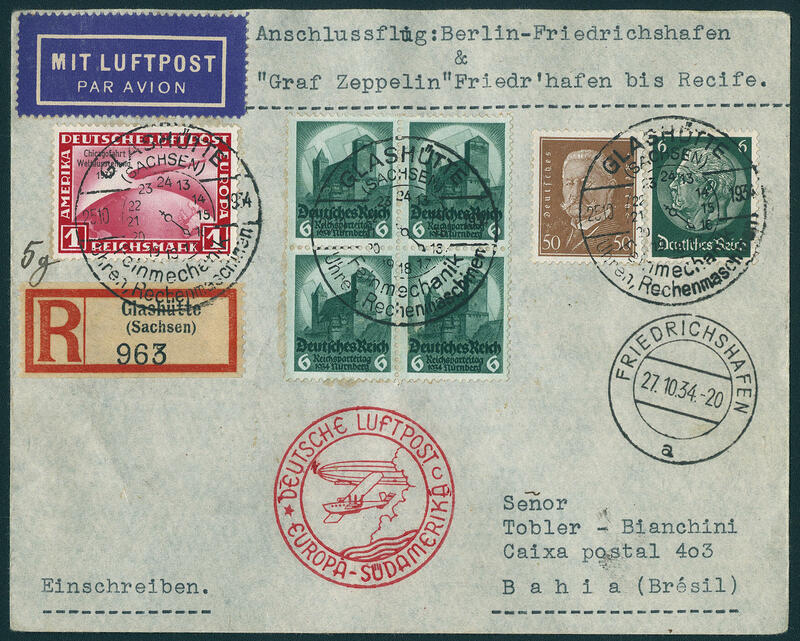 Zeppelin 1936 with attaching three sided perforated blank field and additional franking on very nice Zeppelin cover to the Olympia trip 1936 from \"FRANKFURT 1.8.36. 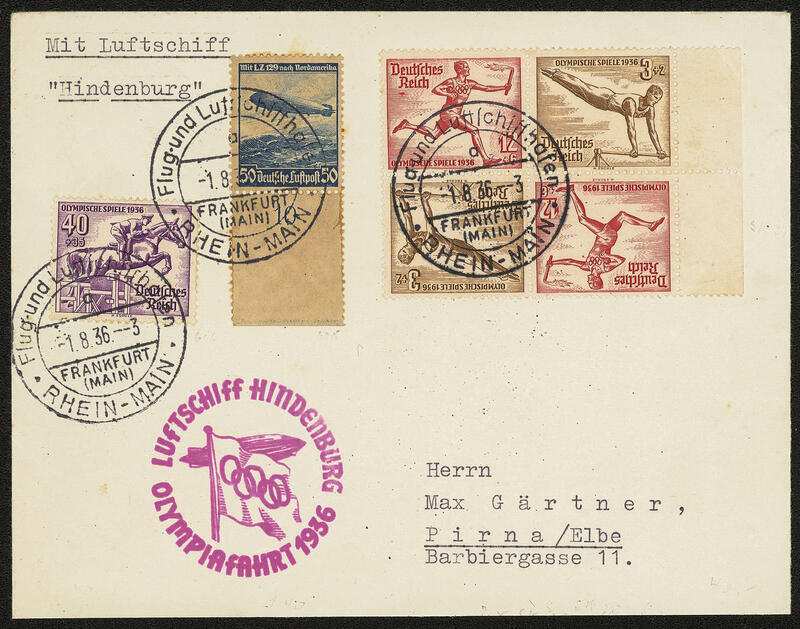 \" with special confirmation stamp to Pirna / Elbe and on the back transit cancellation \"Berlin central airport 1.8.36. \". A large German Reich and Zeppelin rarity. According to the enclosed photo expertize is a the only known Zeppelin cover the Olympia trip with the 50 Pfg. And blank field. Photo expertize Dieter leather International Association for Philatelie Experts.